A few weeks ago, someone asked me what I thought was a very simple question. 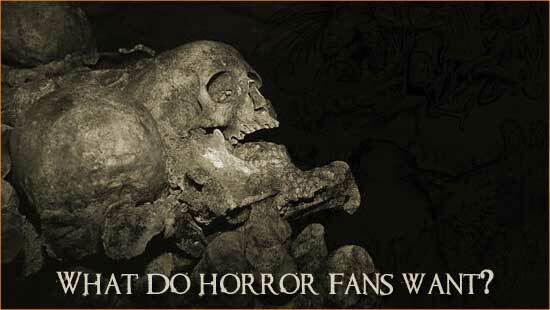 I’ll paraphrase it for you here: What does the horror community want? The question quite honestly stumped me. What does the horror community want? So, I figure in order to find out what the horror community wants, you have to ask the horror community what it wants. To that end, I’ve contacted a number of writers, directors, actors and fans in the horror community to find out what it is they want from horror. This is going to be an ongoing thing, so I hope you enjoy it. Somewhere in our collective consciousness are four blind men. In my mind’s eye, I see them traveling the world together – dark suits and dark glasses – canes tapping, experiencing the world through their hands. Somewhere along the way, they find an elephant. Having never in their wide and varied travels come across an elephant, they work their way around the animal and make an assessment of the beast. One, feeling its trunk, says the elephant is like a snake. Another, feeling its ear, says it’s like a palm leaf. Yet another, touching its side, says it is like a boulder. The last, feeling its leg, says it is like a great tree. Were any of them right? I guess it all depends where you’re standing. I think this was one of the things I didn’t fully understand a year ago. Even after a few years of dissecting movies, my point of view was extremely limited, looking only at things which suited my purpose. But since I’ve had to step outside of my preferred films and styles, I’ve learned a few things. I’ve learned things like being a bad movie isn’t something to be avoided – it is, in fact, its own sub-genre. I’ve learned that social commentary is alive and well in horror – and if you can toss in some bare bosoms and a gushing decapitation, all the better. Most importantly, I’ve learned that there are many different places to stand in the horror community. What I might want from a horror movie (preferring psychological and cosmic horror) will not be the same as what a fan of the slasher film will want. What the Slasher fan wants might not be what the fan of the Zombie film wants. The subjective nature of horror makes pinning down one or ten or fifty things that the genre “needs” no small task. However, regardless of the sub-genre, what the horror fan wants is the satisfaction of an emotional need. Horror movies live or die on that single accomplishment, which in turn is dependent on the sub-genre of the film. Every sub-genre, like some warped little country, has its own language that it communicates to the audience in. We as fans may not always be fluent in these various tongues, but we can learn them on the way to the emotional Mecca. So, while our journey may take us through Camp Crystal Lake or Haddonfield or Transylvania or Zombieland, the destination remains the same. Everything I know about horror is right. Oddly enough, everything you know about horror is right, too. I guess it all depends on where you’re standing.